A fantastic, energy efficient and low cost way to heat your pool. Using a swimming pool heat pump is one of the most effective methods for heating your swimming pool and will substantially reduce your pools running costs. Swimming pool heat pumps do not generate heat directly, they use a small amount of electricity to capture the abundant heat in the air and move it efficiently into the water in your swimming pool. The heat pump, combined with the pool filtration and pumping system, circulates the swimming pool’s water, cleaning and warming it, through a sand filter and then through the heat pump heat exchanger. The heat pumps heater contains a fan that draws in outside air and then directs it over the evaporator coil radiator. The evaporator coil contains liquid refrigerant which absorbs the heat from the outside air and turns it into a gas. The warm gas in the coil passes through the compressor. The compressor then increases the heat which creates an extremely hot gas that then passes through the condenser. 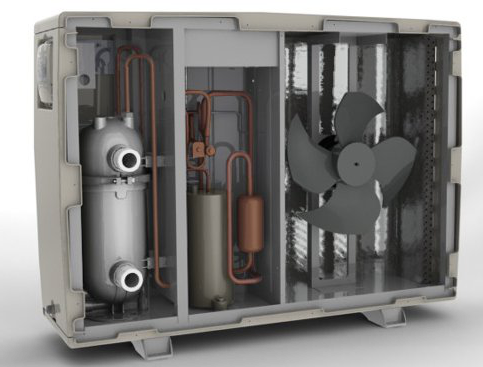 The condenser will then transfer the heat from the gas to the cooler pool water which is circulating through the heat pump pool heater. The heated water is then returned to the pool. As the hot gas is flowing through the condenser coil is returns to liquid form as it rapidly cools and returns back to the evaporator. The whole process then begins again. The high efficiency swimming pool heat pumps usually use scroll compressors compared to standard heat pump units which use reciprocal compressors. 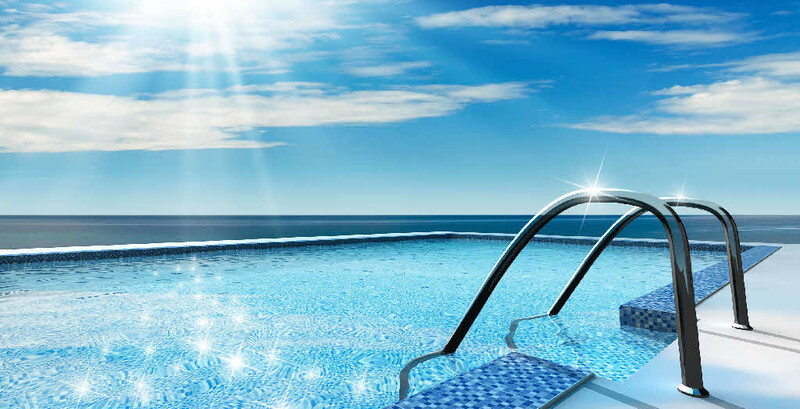 Swimming pool heat pumps work very efficiently as long as the outside temperature is above 6°C (45°F – 50°F) so for outside pools this sits well with the majority of the spring, summer and winter here in the UK. The cooler the outside air the more power the heat pump requires to warm the pool water but since most people use their outside pool in warm or mild conditions this is usually not an issue. Swimming pool heat pumps cost more than gas or electric pool heaters but will typical have much lower annual operating costs because of the greater efficiency that they offer. Another benefit that comes with heat pumps is that with proper maintenance they will typically last much longer than a gas heater which will save you money in the long run. When selecting a heat pump for your swimming pool you should take into consideration size, efficiency and costs. When choosing a heat pump you should have a professional perform a sizing analysis for your specific swimming pool to determine the required heater size. A heat pump is sized in accordance with the pools surface area, volume and the difference in air and swimming pool temperature to achieve the optimal or desired temperature. Other factors should also be considered for outdoor pools such as wind exposure, humidity levels and night time temperatures.